We have two different types of salmon available. The first one is the Atlantic salmon, which is also known as Salmo salar, bay salmon, silver salmon and fiddler. The second one is the chum salmon, which is also known as Oncorhynchus keta or Keta salmon. The chum salmon originates from the Pacific Ocean, which is also known as FAO fishing area 67. Since this is quite far away we have to import our chum salmon from China. However, the same goes for the Atlantic salmon. The Atlantic salmon has been overfished so there is not much left of it to catch. Because of this most of the fish is farmed. Our Atlantic salmon is also farmed in the countries Norway and Chile. But we can still ensure you that our fish is processed, packed and transported in perfectly hygienic conditions since we know our suppliers personally. As a supplier ourselves we sell our salmon portions skinless, boneless and defatted. The flavour of salmon depends on which salmon you have. For example, salmon which is farmed, such as Atlantic salmon, tastes sweeter compared to wild salmon. This is not the only difference between the two types of salmon. Another difference is that the Atlantic salmon has the colour 14+ while chum salmon has the colour 13+. Thereby salmon portions which are made of chum salmon have a lower oil content and contain less calories compared to salmon portions which are made of Atlantic salmon. Nevertheless salmon portions are still very healthy, whether they are made of Atlantic salmon or chum salmon. A salmon portion contains a lot of vitamins, including the vitamins B6, B11, B12 and D. Not to mention they are also a good source of protein, just like every fish. 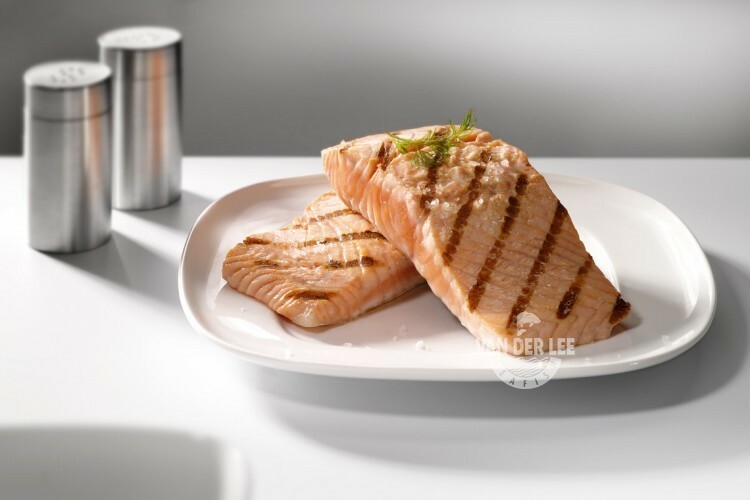 We mainly export our salmon portions to retailers and the catering industry in Germany. However, salmon is actually popular in almost every country. This is one of the main reasons why there are a lot of ways to prepare salmon. One way to serve salmon is to serve it with a sauce or pastry. This is done a lot with chum salmon since this type of salmon cannot be roasted, baked or smoked. On the other hand, Atlantic salmon is smoked a lot. This type of salmon is also often served as sushi. Salmon portions can be served with tagliatelle or vegetables as a side dish. They are also delicious with a sauce or when they are prepared with garlic and herbs.